Note that Tuttle's Livery, next door to 51 Walden, is private property. Please do not park there. There is a large municpal lot located behind the Post Office. 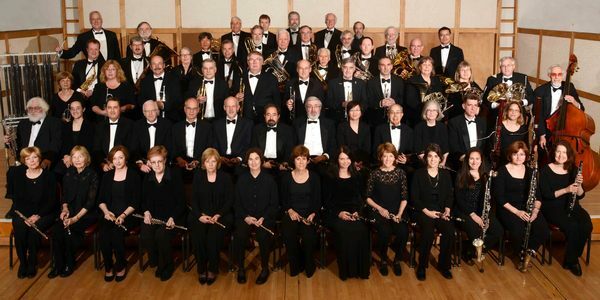 The Concord Band, founded in 1959, is a 65-member community band located in Concord, MA. James O'Dell is the Music Director, and Steven Barbas is the Assistant Conductor. 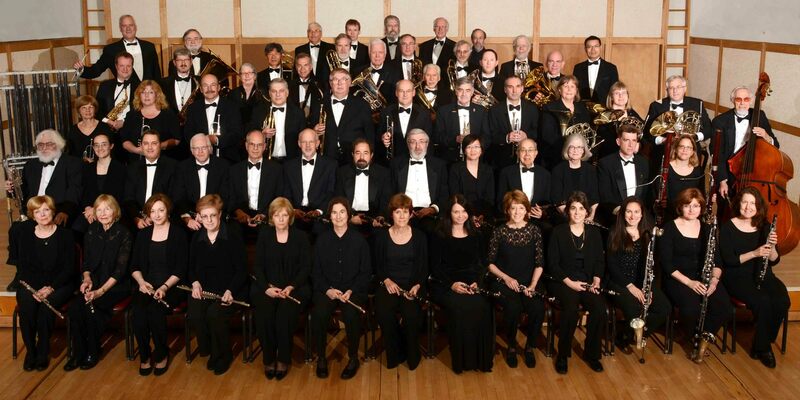 Recipient of the2013 Sudler Silver Scroll Award, Amerca’s most prestigious award for community concert bands. Read about it on the Concord Band Blog. Welcome to our 60th season! 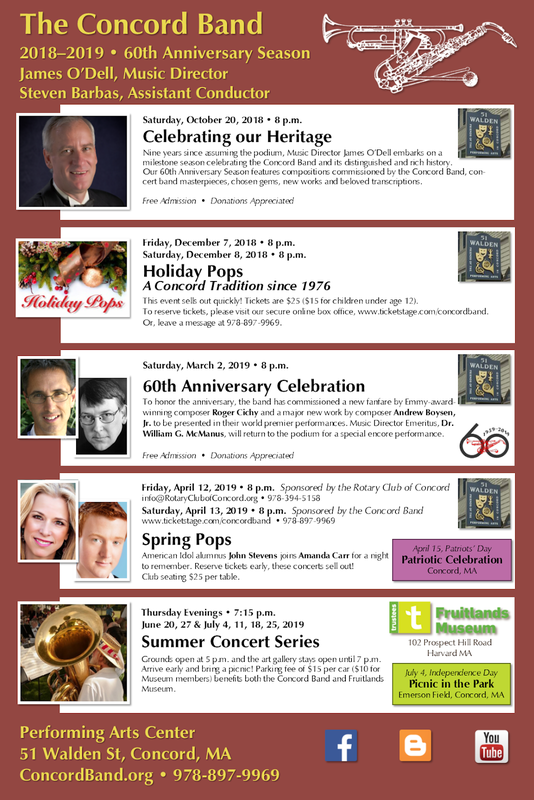 We have a terrific schedule of concerts. Please browse our extensive collection of on-line information. Click here to subscribe or unsubscribe to our newsletter. This is a free concert. Donations will be gratefully accepted. have on Apr. 22 has been cancelled. We'll be on at TBD. We play at 3:00, but come down early and enjoy all of the other activities. The theme this week is Spectacular Broadway! Boston Harbor Yacht Club, Boston, MA. The Concord Band is looking for musicians who would be willing to be on our “call list” to fill in for absences in rehearsals or performances. If you'd like to play with us or know someone who might, please get in touch with either Jim O’Dell, CBA Director or Dave Tweed, CBA Personnel or leave a message on the band’s answering machine at 978-897-9969. We'll need your contact information, the instrument(s) you play, and a brief synopsis of your background. 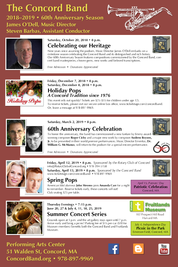 Since 2008, some of our concerts have been recorded and made available by Concord-Carlisle TV. See our Concert Videos page. Concert Schedule. Mark your calendars now! Our Scrapbook. Pictures and other notes from past events. Join our Mailing List and receive your ownfreesubscription! The Concord Band Salutes America Our third CD, released in 2004. Call to get your copy! Contribute to the Band. We appreciate both your financial support and your volunteer time. Biographical Sketches. Musical directors, guest conductors, guest artists, and soloists. Program Notes. Selected band literature. Web Links. Selected web sites. About the Band. What we are, historical notes. Who is in the Concord Band? Your neighbors! For Band Members Only. Information for band members, schedule of rehearsals.